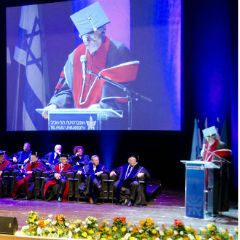 PM Benjamin Netanyahu recognizes Tel Aviv University's fertile "environment for innovation"
In an impressive ceremony at Tel Aviv University during its annual Board of Governors Meeting, Israeli Prime Minister Binyamin Netanyahu awarded the fourth annual Prime Minister's Initiatives and Innovation Prize to Dafna Lifshitz, CEO of Appleseeds Academy. The grassroots organization will receive NIS 80,000 ($23,000) to further its efforts to provide technological training to disadvantaged populations — notably Bedouin, Druze, and ultra-Orthodox women — and integrate them into mainstream Israeli society. 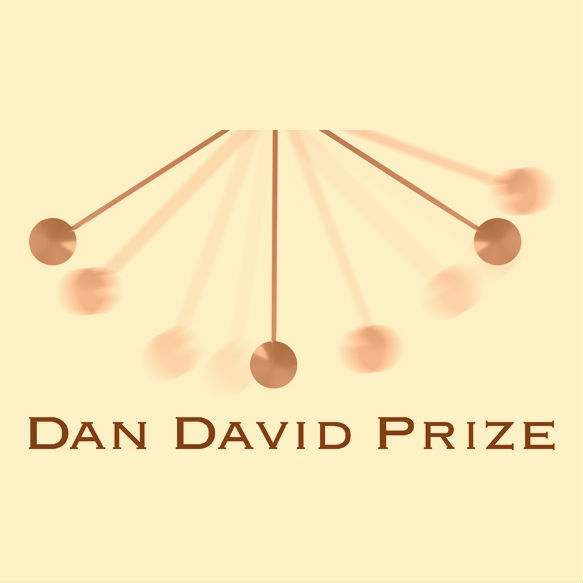 The Innovation Prize, as it is commonly known, was born in 2010 out of the prime minister's personal conviction that "the future belongs to those who innovate" and that "only through innovation can we find better solutions to the most challenging problems." Recipients of the annual prize can be either commercial businesses or non-profit organizations. This year, the Prime Minister also bestowed honorable mentions on four other entities, each of whom will receive NIS 30,000 ($8,660) to further their innovative work. The 2014 Innovation Prize selection committee included Dr. Giora Yaron, Chairman of Tel Aviv University's Executive Council, TAU's commercialization entity, Ramot, and co-chairman of the board at Itamar Medical; Prof. Eugene Kandel, head of the National Economic Council; Tammy Hauspeter, adviser to the Prime Minister; Intel Israel general manager Maxine Fassberg; Prof. Dafna Schwartz of Ben-Gurion University of the Negev; Dr. Harry Yuklea of the Technion-Israel Institute of Technology; and Start-Up Nation co-author Saul Singer. 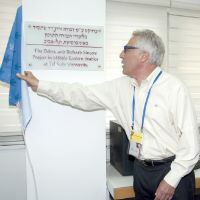 "Thanks to Tel Aviv University for hosting us," said PM Netanyahu. "To the winners and their families tonight, this is our excitement — not yours — because you are providing the innovative solutions to Israel's problems. "The future belongs to those who innovate. It allows us to include weaker elements of society and also allows us as a nation, as a country, to provide services that are constantly improving. The speed of innovation in Israel is breakneck — centers like Tel Aviv University, of such focused intellectual energy, nurture it; our security situation demands it; our business environment and free market encourage it; and lastly, everything is 'in the neighbourhood,' close by &mdsah; all of the relevant players are easily able to meet and make things work. These factors together create precisely the right environment for innovation." "We are trying to help bridge the gap," said Ms. Lifshitz upon receiving her prize. "Appleseed Academy trains women who subsequently each train 800 other women. After undergoing training, these women are for all intents and purposes able to integrate into Israeli society — half of our graduates find high-quality employment within six months and 65 percent of our graduates end up serving in elite technological units of the army. By investing NIS 40,000 ($11,500) in each woman, the country gets back in savings NIS 500,000 ($144,300). By providing technological tools and the development of life skills, we can provide equal opportunities to Israel's socially disadvantaged communities," she said. In the not-for-profit category, Ayala Tal-El received an honorable mention for her organization Israel AV, which works with deaf and hard-of-hearing children, and seeks to integrate them in mainstream schools with the aid of innovative therapies and technology. "Statistics show that those who use our strategies can do anything," said Ms. Tal-El. "Our objective is for any parent whose child was diagnosed as hard of hearing be able to access our clinics." Three commercial businesses also received honorable mentions. Zeev Birger, founder of Top-It-Up, was honored for innovative vision in developing floating modular covers for reservoirs to minimize evaporation and improve water quality. "I heard the commercial — 'Israel is drying up' — and I started seeking solutions to save water," said Mr. Birger at the ceremony. "I saw that through my method, evaporation decreased by 90%. If we manage to cover all of Israel's reservoirs, we might be able to double our water supply in Israel." Amihai Miron, co-founder and CEO of User1st, which provides accessible versions of websites for users with a wide range of physical disabilities, and Ziv Dubinsky, founder of Metabolic Robots, which developed an automated poultry feeding system that significantly increases efficiency and profitability as well as improves the quality of food in Israel were also recognized. In his closing remarks, Prime Minister Netanyahu said, "Soon there won't be a distinction between high tech and low tech. Food, water, air, energy — everything is becoming technologized. The future belongs to those who innovate. We want to build on our traditions to seize the future, and we welcome your partnership."